At the annual Hire & Rental Industry Exhibition held in Adelaide, No Bolt introduced the Ezypak platform to members of the Australian Hire & Rental Industry. 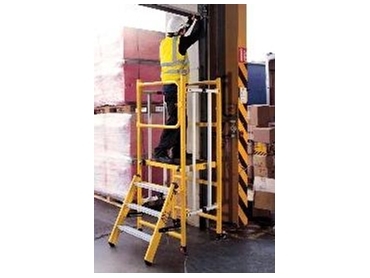 The Ezypak is the new invention from the UK where it has been met with great enthusiasm as it addresses the new requirements of the British and European health and safety standards for working at limited heights. The Ezypak is a lightweight yet durable work platform that is easy to handle, simple to assemble and safe to use by one operator. The unique flat pack design simply unfolds and locks into position. The two position deck hinges into place and the hinged ladder locks into position for easy access. The gate can be secured when standing on the platform. The Ezypak is available in 2 models, each with 2 platform heights and a Safe Working Load of 150kg.